Last week, a meeting of the National Space Council signaled a realignment of the nation’s priorities in space. Where the Obama administration had set its sights on an eventual Mars mission, Vice President Pence instead challenged the space industry to aim for the moon again. But what will it take to turn that speech into reality? Loren Grush, science writer at The Verge, says that in order to make a moon mission a reality, there will need to be significant changes to budgets and space funding. Loren Grush is a science writer at The Verge, in New York, New York. JOHN DANKOSKY: This is Science Friday. I’m John Dankosky, Ira Flatow is away. Later this hour, we’ll be talking to a panel of science fiction authors about building other worlds. But first, traveling to other worlds a bit closer to home. Last week, the newly formed National Space Council met for the first time. It’s supposed to help set government policies with regards to space. 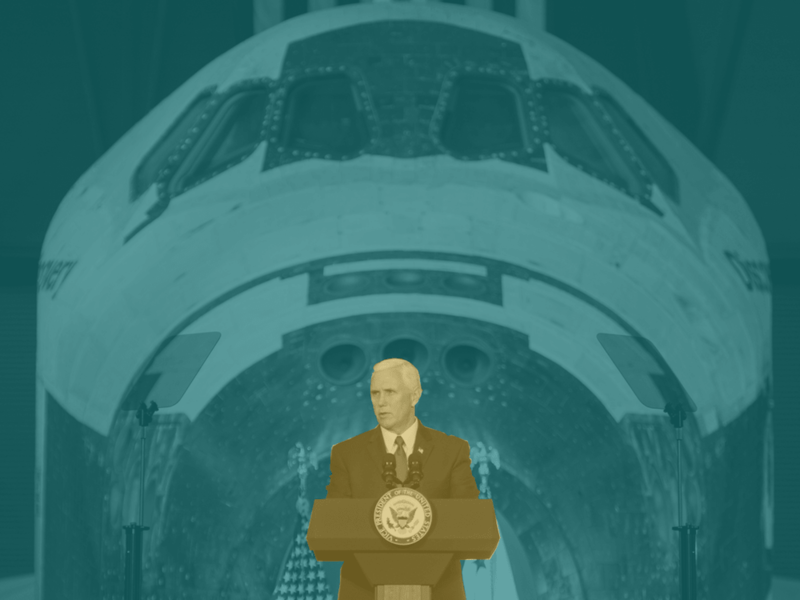 And in a speech before the council, Vice President Mike Pence called for a return to the moon and the development of a base there. During the Obama administration, of course, the moon had not been a priority, with the focus being on an eventual mission to Mars. So how big a deal is a pivot to the moon, and what would it take to make it happen? When space programs can take years to complete, will anything ever get done in a world where government policies can whiplash every four years? Joining me now is Loren Grush. She’s the space reporter for The Verge, and she joins us in our New York studios. Welcome back to the show, Loren. LOREN GRUSH: Thank you for having me. JOHN DANKOSKY: So first of all, explain what the National Space Council is or is supposed to be. LOREN GRUSH: It’s basically another executive group. It has many prominent politicians, like Vice President Mike Pence, Secretary of State, and many other members of the cabinet. And then it also calls on experts within the space industry to, kind of, guide the agenda for space policy, whether that’s NASA, commercial space priorities, or the military. JOHN DANKOSKY: So is it guiding administration policy on space, or is the administration guiding its policy on space? LOREN GRUSH: I think it’s more of a guide for the administration. So what they’re doing right now is kind of information gathering. They’re asking people, prominent experts within the community, the space community, what they’d like to see from the administration. They’re listening. And then in a month or so, they said 45 days after this past meeting, they’re supposed to compile basically an agenda on how they’re going to get all of these priorities done. And I think then that is supposed to go on to the administration. And then they’ll say, OK, this is how we’re going to implement it. JOHN DANKOSKY: OK, so flesh out what Vice President Pence said about going to the moon. I mean, what exactly are we talking about here? LOREN GRUSH: Well, it was a little more specific than his last speech, when he went to Kennedy Space Center earlier this year and said, we are going to the moon. But we didn’t– he didn’t really elaborate on this. So this one was more, we’re putting American boots on the moon and we’re going to establish a foundation there. And then we’ll go on to deep space into Mars, or deeper into space and on to Mars. So in this instance– and he wrote a Wall Street Journal op-ed, as well, that also said we are going on the moon. So this is confirmation of what we’ve all been suspecting, which is that this administration is going to pivot back to the moon. And we’re going to put people on there, not just send them near the moon, which was kind of the idea previous to this. JOHN DANKOSKY: Well, so near as you can tell, is this a shift that is based in anything new that’s transpired since the Obama administration, in which scientists are saying, well, maybe the moon is the place to go? Or is this another one of these political priorities that seems to be shifting, like, we see, I don’t know, in health care, taxes and a lot of other stuff? LOREN GRUSH: I think when it comes to the science, there hasn’t been much of a shift. But I’m sure people have been very– a lot of people have been very interested in going to the moon for a number of reasons. A lot of companies are interested in going there for mining for resources. And there are a lot of other scientific priorities. So that hasn’t really changed all that much. I definitely think this is much more of a political shift in terms of the priorities of this administration. And you can read into it what you will. I think one major reason for the shift is you have the executive director of the National Space Council, which is Scott Pace, and he’s made it very clear that he thinks NASA is a great tool for international cooperation. And right now, in the international community, the moon is hot, [LAUGHTER] if you will. A lot of state agencies want to go there, Russia, European Space Agency, JAXA, the Japanese space agency, and China is very interested. So I think they’re trying to, maybe, realign NASA’s priorities with what the international community’s priorities are. And then, of course, you might read into some politics of it, too. I mean, during the Obama administration the moon was kind of a dirty word, [LAUGHTER] in a way. Because, during a speech when he set the policy, he said, to the effect of, we’re not going back to the moon because we’ve been there, done that. And ever since then, it kind of squashed any talk of putting people back on the moon. So I think it’s kind of reversing that train of thought, now. JOHN DANKOSKY: But it is interesting, the Trump administration– which in some ways hasn’t exactly been very interested in what other countries are doing around the world, more focused inward– is interested in, potentially, a more attainable goal that’s more aligned with international ideals. LOREN GRUSH: Yeah, I mean, I think it could be a very smart international or geopolitical tool if they do it correctly. So I’m not sure if– I’m just reading the tea leaves. I don’t know if that’s exactly what they’re doing. They haven’t really elaborated on it. But it seems that to be the case. JOHN DANKOSKY: So from a practical standpoint, let’s say, you’re at NASA. And you hear this from the vice president and the National Space Council that now the priority’s shifted from Mars to the moon. And you’ve been, I don’t know, for the last 10 years, working on a big rocket to go to Mars. JOHN DANKOSKY: I mean, what happens, what shifts in your job? LOREN GRUSH: Well for now, nothing. So for now, it’s mostly a symbolic shift. It’s just words, because we don’t have any change in the budget. We don’t have any change in the priorities or the programs that are being funded. So for now I think, it’s just anticipation for people, maybe, weren’t enjoying it at NASA who were working towards going to Mars. Or maybe they have been. So for now, maybe some people are getting excited, or others aren’t. But yeah, they’re just going to keep working on those vehicles. And I think the biggest sign we’ll see of any kind of change is a shift in the budget, the presidential budget that comes out early next year. Maybe they’ll appropriate funds– or not appropriate, but ask for funds for a Lander or for habitat development, or something like that. We don’t know. But if any big, realistic change is going to happen, I think we’ll see it next year. JOHN DANKOSKY: Well, and that’s the key point to what you’re reporting. And everyone who watches this says, you know, you can say whatever you want. But it all comes down to the budget. If there’s money for it, then it’s actually going to be real. And is there going to be the budgetary money necessary to put into a new moon mission, given all the other constraints that we have on NASA’s budget? LOREN GRUSH: Well, I mean that’s been, kind of, one of the main criticisms of the journey to Mars, too, is the lack of funds for everything else that we’re going to need. I mean, the money wasn’t there for a Mars Lander, so it’s definitely not there for a lunar Lander yet either. And in order to get that money, there aren’t a lot of options for what you can do. I mean, like I said in the article, you can raise the budget, which probably isn’t going to happen. I mean, Congress is very enthusiastic about NASA, for sure. And they have been giving NASA more money than the president has requested. However, this administration is all about cutting the deficit. So I’m not getting my hopes up about a huge budget increase. And there’s really no geopolitical reasons to do so. I mean, the last big, huge budget increase was with the Apollo missions, and that had a very clear driving factor behind it, which was the Cold War and our race with Russia. So that’s one option, give more money for more programs. Or you can slash current programs within NASA’s budget. And there are two that I think are kind of vulnerable right now, which are Earth science, because many space advisors for the Trump administration have talked about getting rid of that program completely and transitioning all of NASA’s satellites to NOAA. However, Earth science doesn’t take up a lot of the budget, so you’re probably going to need even more money than what Earth science is taking up. So I think a big point of contention is going to be the International Space Station. That’s a $3 billion to $4 billion a year program. You know, it’s done great so far, but if our priorities are really about going into deep space, a lot of people are probably going to start arguing that it’s time to retire that, and use those funds to develop other technologies. JOHN DANKOSKY: And the life cycle of a space station, as it is, isn’t that much longer, right? I mean, we’re talking another decade or so? LOREN GRUSH: It’s currently slated to run through 2024, and a lot of experts have said it could last longer than that. But yes, all spacecraft come to an end. And I think it’s had a very good, long life. I still think there’s immense value to the International Space Station. So I would prefer not to see it go. But you know, it just depends on what the administration wants to do. And you know, they’ve already had talks about this. There’s the possibility of handing it over to the private sector and having commercial companies take on that cost of operating it. But that’s a lot of cost, $3 billion to $4 billion. And a lot of companies just don’t have that money to completely maintain everything itself. JOHN DANKOSKY: I want to talk about some of the other companies, but very quickly, that Earth sciences piece. Not a very big part of the overall budget, but increasingly an important part of what NASA does, right? I mean, this is the part of NASA that tells us about climate change. And I don’t know, satellites up there showing us where the next hurricane’s coming, or mapping a world that’s filled with wildfires, seems like a pretty good use of some NASA funds. LOREN GRUSH: Yeah, and I think a lot of researchers look to that NASA data. It’s very valuable data. A huge study just came out, we reported on yesterday, about how a NASA satellite has been used to learn all of this crucial information about the carbon cycle. So I mean, to be fair, they’re not suggesting getting rid of the satellites. They’re just suggesting them to transfer to the National Oceanic and Atmospheric Administration. But they’re not suggesting to raise their budget either, so it would be a big question of how that would work. JOHN DANKOSKY: Well, in the last couple minutes that we have, I think that question of what private companies, like SpaceX, I mean, how are they going to get involved with all this? And is that really going to be how we’re going to do whatever we’re doing next, go to the moon or to Mars or wherever? LOREN GRUSH: So that’s one of the huge things that I talk about in the article, too, which is a way to drive down costs of these huge government space programs is to leverage public and private partnerships. And a lot of these companies are developing their own vehicles with their own private investment and their own profits. Yes, they do want some NASA money, but they are putting in a lot of their own investment. And it’s going to be so much cheaper to develop and so much cheaper to launch. JOHN DANKOSKY: Yeah, and now the question is, of all the things we could get done, what is that next thing? Loren Grush is space reporter for The Verge. Thanks so much for bringing us this story. I appreciate it. LOREN GRUSH: Thanks for having me.